The Cleveland Browns are a professional American football team that resides in Cleveland, Ohio. The team was established by businessman Arthur B. McBride and coach Paul Brown on June 4, 1944. Cleveland is unique in the way of being the only team out of the 32 teams in the NFL that does not have a logo on their helmet. This is because the Browns were named after Paul Brown, which also makes them the only team in the NFL that was named after an individual. There is a long history in Cleveland, and contrary to current events, the Browns were once the class of the professional football world. The Browns organization holds eight championships altogether. 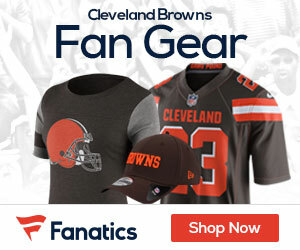 Despite never winning a Super Bowl, Cleveland won four straight AAFC Championships from 1946 to 1949 and continued their winning ways into the 1950s winning the NFL Championship in 1950, 1954, 1955 and their most recent championship in 1964. Despite proven, continued success out of Browns co-founder and head coach Paul Brown, then current owner Art Modell fired Paul Brown on January 9, 1963, due to rising displeasure coming from star running back Jim Brown and quarterback Frank Ryan. Brown was replaced by longtime assistant Blanton Collier who led the Browns in his first year to a 10-3-1 record earning their first berth to the title game in seven years, which they went on to win. That would be the last title the organization would go on to win. Not winning a title does not discount the success Cleveland has produced throughout their long history. 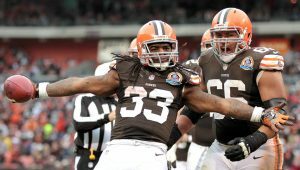 Up until 1989, the Browns have managed 12 division championships; three AAFC Championships from 1946-1948, three NFL Century Championships from 1967-1969 and six AFC Central Division Championships in the years 1971, 1980, 1985, 1986, 1987 and 1989. They have failed to capture a division title since then. The main struggles for the Cleveland Browns have mostly been accumulated since 1999 after coming back from being a “deactivated NFL team” from 1996-1998. In 1996 then-owner Art Modell, who purchased the team in 1961 for four-million dollars, decided to move the team to Baltimore after getting the deal approved by the other 29 NFL team owners. The move was sudden and shocked the football world and more importantly, the city of Cleveland. Leading up to 1996 Modell had requested an extension of their standing sin tax that would fund renovations and improvements to the then home of the Cleveland Browns, Municipal Stadium. Municipal Stadium was owned by Stadium Corp. which was led by Modell. In 1993, while the Cleveland Indians, Cleveland’s professional Major League Baseball team, played their home games at Municipal Stadium, sharing the stadium with Modell’s Browns, they asked the city for a new stadium as they grew dissatisfied with Modell. The Indians got their wish, moving out of old Municipal Stadium into their brand new Jacobs Field, currently Progressive Field. The move disgruntled Modell as he lost revenue from the Indians’ 81 home games a year plus the loss of suite purchases as members moved their suite leases to Jacobs Field. All of this set off Modell and days before the city of Cleveland was ready to extend the sin tax that he originally asked for, Modell moved the team to Baltimore after secret discussions with the state of Maryland. After many discussions and meetings, the NFL, Modell and the city of Cleveland came to an agreement that existing contracts of players and personnel would be held onto and transferred to the new Baltimore Ravens organization. While the players and staff would move to Baltimore, it was agreed upon that the intellectual property of Cleveland Browns, the name, logos, training facility and history, would all be kept in Cleveland and that the Cleveland Browns organization as a whole would be referred to as a “deactivated” team until 1999. The deal was that a team whether it came from relocation or expansion, would end up back in Cleveland, Ohio. 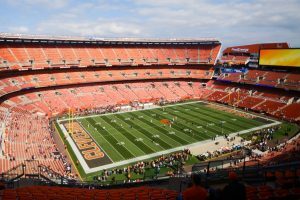 When the Browns returned to the league in 1999 as an eventual expansion team they were placed in the AFC Central, the long-standing division they sat in up until 1995 and played their games in the brand-new NFL stadium now called First Energy Stadium. Municipal Stadium was demolished after the Browns moved to Baltimore. The division placement was agreed upon by the league and team due to a stipulation demanding they be placed in the same division as the Pittsburgh Steelers and Cincinnati Bengals due to rivalries shared between the three teams. Browns would be placed in the newly created AFC North which included Pittsburgh, Cincinnati and the Baltimore Ravens. Upon return, the Browns weren’t the Browns the fans of Cleveland grew to know and love with only the name and colors staying the same. Before 1999, the Browns won eight championships and secured 12 division titles. Since their return, they have neither a championship or division title and have only had one winning season (2007) and one playoff berth (2002) where they would lose to the Pittsburgh Steelers in the AFC Wild-Card Round. The lack of team success has been due to the “carousel” of quarterbacks, front offices and coaching staffs since the team returned. Since 1999 the Cleveland Browns have started 28 quarterbacks, hired nine different head coaches and have had seven different front offices. Despite the lack of success since 1999, Cleveland’s fan base has stuck by and proved to be one of the best fan bases in football producing around 355 ‘Browns Backer Clubs’ throughout the world including 14 different countries. Cleveland also has an extensive list of celebrity fans. Those fans include the late Elvis Presley as well as professional wrestlers The Miz and Dolph Ziggler, MLB Hall of Famer Hank Aaron comedians Arsenio Hall and Drew Carey, political scientist Condoleezza Rice, rapper Machine Gun Kelly and country artist Brad Paisley. The Cleveland Browns history is rich with winning and legendary players and coaches. And while the team continues to underperform in this 2017 season, the future, as always for Browns fans, looks oh-so-bright.